Time flies. Family life, work life, church life, and then all other stuff. 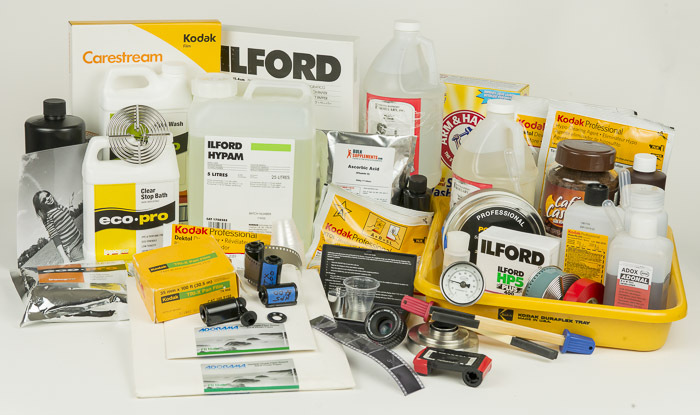 The darkroom finds itself in the other stuff category at the moment. I did make two critical modifications to the developing rack, though – running water and storage. It took the first two rolls to realize that my dad was a real pioneer developing without running water. I fabricated, after a lot of trial and error, a manifold that feeds shower outlet water to a faucet above the top sliding developing tray, the film washer, print washer and a hand sprayer. This photo was taken with a tripod-mounted Nikon F2 and a 24mm f/2.8 Nikkor (exposure unrecorded) on Ploypan F shot at ASA 100. It was developed in Adonal (Rodinal) 1+49 for 60 minutes, agitated for the first minute, then at 15, 30 and 45 minutes, then printed on Adorama multigrade glossy RC at maybe grade 2. It’s very contrasty, but the shot wasn’t a good test because there aren’t many midtones in the stark white bathroom with a white PVC rack, black work surfaces and dark brown storage bottles. 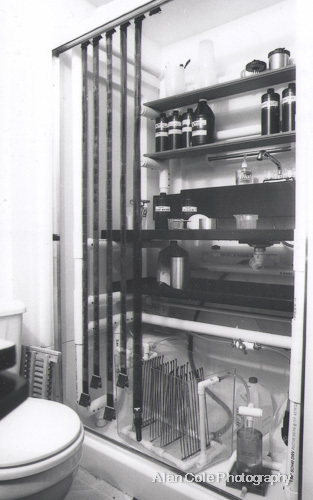 Equipping a new darkroom with chemistry, paper and equipment can be as minimalist – or as extravagant – as you chose. It’s also possible to get a little carried away, if you can imagine that. Here’s what even a small collection of consumables looks like for someone like me who wants to get back into what they left years ago. Not an extreme collection by any means; it just takes an assortment of things for a comfortable start-up. The Tri-x is one of several 1982 vintage rolls that my mom bought for me just as silver started to skyrocket (Hunt brothers debacle) and we were afraid there wouldn’t be any more film that we could afford. My sister found it and was kind enough to sent it to me. It has pretty bad base fog and I’ve been meaning to get some HC-110 or L110 and try that because they a good reputation for minimizing fog. I know now that Rodinal isn’t the developer for aged-out film. Stay tuned for more. Later.